Nutritious food is medicine for people facing illness. Project Angel Heart was founded in 1991 to address a major challenge for Coloradans who are ill: getting the nutrition they need to get stronger, heal, and remain at home. Many are too sick to get to the grocery store or unable to cook for themselves. Others find they have to choose whether to buy food or medication to make ends meet. That’s why Project Angel Heart prepares and delivers medically tailored meals to people living with life-threatening illnesses. Each week, our professional chefs and registered dietitian prepare thousands of delicious meals, from scratch, and tailor them to meet the medical and dietary needs of those who are ill.
Loving volunteers package and deliver each meal, free of charge, to neighbors living with cancer, HIV/AIDS, kidney/heart/lung disease, and other illnesses. In 2019, we will prepare and deliver nearly 500,000 nutritious meals to 3,000 critically ill neighbors in Denver and Colorado Springs. The results? Improved health and well-being for those in need. 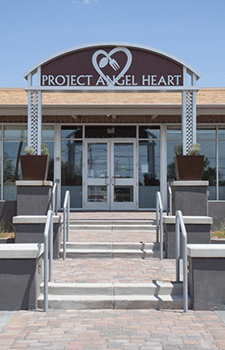 Project Angel Heart’s meal recipients report better health, less stress, and more energy. They’re better able to afford their health care and adhere to their prescribed health care regimen. And it’s easier for them to live independently in their homes. Groundbreaking research also shows that many Project Angel Heart meal recipients have lower health care costs and hospital readmission rates. Our community is healthier, happier, and stronger because nutritious food is valued as a key component of health and available to all who need it.